Henry Clay Fry was associated with several nineteenth century glasshouses in the Pittsburgh, PA area, including the Rochester Tumbler Company. Although it has been said that Fry obtained the first cut-glass design patent that was granted in this country, in 1868, some observers now believe that this patent was for pressed glass, not cut glass. Cut glass was, however, produced at the Rochester Tumbler Company, from 1872 until the plant was destroyed by fire in 1900. The following year Fry established the H. C. Fry Glass Company (originally called the Rochester Glass Company), a full-range facility where cutting began in 1902. For many years the company supplied blanks — both plain and “figured” — to numerous cutting shops around the country. Also in 1902 the peripatetic Fry became associated with the Empire Cut Glass Company, originally of NYC, but the company relocated to Flemington, NJ in 1904. This association continued until at least 1922 when color-cased blanks were produced at Rochester and cut by Empire (and perhaps at the Rochester plant as well). Today, identical cut-glass patterns can be found in the catalogs of these two companies. When this occurs only items that carry a Fry trademark can be attributed with certainty to the H. C. Fry Glass Company. (The Empire Cut Glass Company registered at least one trademark, but it apparently was used, if at all, only on paper labels.) The Fry trademark shown above, on the right, is the one usually found acid-etched on glass, but it is said that this script signature can also be found enclosed within a shield. The company produced some unusual “show” pieces of cut glass early in its history, including a 31″H vase in the Sunbeam pattern (1902), a four-and-a-half foot tall punch bowl and stand in an unnamed pattern (1905), and a cut-glass replica of the Liberty Bell (1906). The quality of Fry cut glass was excellent during these years, but it deteriorated soon thereafter. Many collectors believe that the highly-regarded reputation that Fry cut glass has today is, in general, somewhat over-stated. The company’s use of “figured” blanks is especially regrettable. The H. C. Fry Glass Company went out of business in 1933, four years after the death of its founder. The following “cut” appears in an “old magazine” that was published in 1905. It shows the company’s Rochester pattern on blank no. 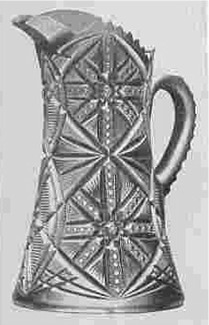 4054, a jug. The pattern name “Rochester” has also been assigned by some researchers to the pattern that is cut on the monumental Fry punch bowl that was exhibited at the Lewis and Clark Exposition in Portland, OR in 1905. The pattern on the punch bowl does not match the Rochester pattern illustrated here. H. C. Fry Glass Society, 1990: THE COLLECTOR’S ENCYCLOPEDIA OF FRY GLASSWARE. Collector Books, Paducah, KY, 207 pp. [c1901-c1905 Catalog] BLANKS: HAND-MADE, BLOWN AND MOULDED. American Cut Glass Association, 1997, 30 pp. [c1908 Catalog] CUT GLASS CATALOGUE (as issued in Bremen, Germany). In the Fry Glass Society reference above, pp. 192-202.